This route is easy to find and follow. You'll find the starting point in town about 15 minuets west of Leesburg, VA called Bluemont, VA. At the intersection of route 7 and route 601 just take route 601 southwest. Immediately the 601 will climb to the spine of the mountains and you just stay on this all the way till it ends when it drops down out off the mountain and runs into US Highway 50. This is a favorite ride of mine that I stumbled on a few years ago when my work sent me out to some FEMA command center out in just northeast of the Blue Ridge Parkway. It's about 15 minutes west of Leesburg and once I got out there and turned on to VA 601 I knew that I had stumbled on to what is a very nice little stretch of motorcycle road. The whole 11 or so miles rides along a not very well known spine of a section of the Blue Ridge Mountains (just look at the Google Maps Satellite view of the road to see how it drives right over the top ridge of the mountain range). You'll be riding through beautiful thick lush forest with a few sections were it opens up a bit for some views of fields. Another sight to enjoy along the way are the beautiful homes. Some really smart (and rich) people have built their dream homes along this stretch of mountains with what I imagine would be jaw dropping views from there back decks. Much of the road is lined with some really authentic looking (I can't tell if it's really old or just made to look that way) stone fencing traveling for miles along the road. At the very end of the route when 601 runs into US Hwy 50, make sure you take that (Hwy 50 east for just a mile or less and you'll take in a great valley view (see pics below)). The following addition was contributed by Ralph C in March of 2014: A beautiful soul-stirring ride along a mountain ridge flanked by beautiful forests. Nice enough during the summer, this is spectacular in the fall. This road is a nice bookend to Snickersville Turnpike, since the northern access is about a half-mile west of the Turnpike/Route 7 intersection. The road conditions are perfect in terms of quality of the road surface ... no potholes or even gravel to avoid. The turns are modest and so are the elevation changes ... this one won't require any peg dragging but the tameness of the roads will at least let you take in all the nice scenery up there. The road wasn't crowded but it wasn't empty either ... like I said before there is a FEMA center up there and homes so the workers and residents make up most of the traffic. The following addition was contributed by Ralph C in March of 2014: The road runs southwest from Route 7 along a picturesque mountain ridge bracketed by beautiful mountain forests and a few spectacular homes. There are gentle curves at the top, which get progressively tighter towards the south. About halfway down, you pass the Mt. Weather FEMA facility. Smile big for the cameras. I had to be honest and give this a 1 for amenities because there really isn't anything to do along the way (not even restaurants or gas stations) but DON'T TAKE THIS ROUTE BECAUSE YOU WANT TO SHOP FOR TRINKETS, TAKE IT FOR IT'S BEAUTY AND REMOTENESS. All the below pictures were taken where the route ends at the intersection of Rt 601 and US Hwy 50. You have to travel a little east (a mile or two) on Hwy 50 to see the valley view and check out the old town with the old buildings. on September 19, 2016 1 out of 1 members found this review useful. BEAUTIFUL stretch of road -- Watch out if you are turning from 50 Eastbound-- the road from 50 to 601 dips down, has a ditch to the left and curves right into 601 -- Traffic going on 50 West comes over the crest of a rise and is not visible from a distance. However, 601 is AAAWESOME, twisty curvaceous, old and new houses set waay back into the thick forest. Beautiful views seen way in the distance. Deer and feral pigs are also 601 wayfarers, enjoying the vegetation and could easily come out from behind those trees. Great ride! When paired with Snickersville Turnpike, it makes for a really nice loop. The northern terminus of the turnpike is only about a half mile from this road. on February 9, 2013 1 out of 1 members found this review useful. I like this road and try to hit it when I'm in the area. There are no views from the road but it has a couple of places along where you can stop and get great views with a very short walk. One is Bears Den. It's an old home that has been converted to be used a a hostel for Appelachain Trail hikers. Behind the home is a cliff looking to the west with great views. Another place I'll hit when on this road id The Horseshoe Curve restaurant. On thenorth end of 601 where it hits Rt 7. turn left(west) and go approx. 0.4 miles to old Rt 7 - Pine Grove road. Turn Right and go 0.3 Miles to the reataurant on the left. Nice local joint, usually has dogs laying around on the floor. Good Food. The owner's name is Tracy. on November 2, 2011 1 out of 1 members found this review useful. on May 2, 2011 1 out of 1 members found this review useful. This is a great road!! I saw this on MotorcycleRoads.com and decided to give it a try (despite the fact that the ratings on it I saw were low). It really does travel along a "spine of mountains" ... little traffic and LOTS of nice scenery and nice little curves along the way. Very pleasant surprise for me and my riding partner. on August 9, 2010 1 out of 1 members found this review useful. There is a country store in Bluemont, just south of Route 7. Deck and table out front. It's on Snickersville Turnpike. Coming from Rt.50 make a R on Rt.7 and a R on Snickersville/734. Nice hairpin before a straight descent past the store. 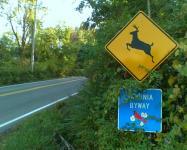 Or make a L on Rt.7 and R on Pine Grove Rd./679, a curve or two and a place or two to stop for eats. Then back onto Rt.7. on July 7, 2010 1 out of 1 members found this review useful. This is indeed a nice stretch of road between 7 and 50. Uncle Sam has done a good job of keeping it nice and maintained due to the "facility" at the top of the hill. 606 that runs along the Shenandoah is a nice little run too. It's only a mile or so west on 7 or 50 depending which way you run 601.
on January 24, 2009 1 out of 1 members found this review useful. We rode this route last May 2008, and it is awesome!! But you must go all the way to the south end of the Parkway to Tennessee. We took 3 days to do it, stopping along the way several places. The scenery is AWESOME!! It's like being in heaven. Enjoy!! on July 24, 2018 0 out of 0 members found this review useful. There is however a restaurant less than a mile from the 601 / Rt. 7 intx. .The Horseshoe Curve Restaurant. Go west on Rt. 7 for 0.4 miles. Turn right on Rt. 679 Pine Grove Road. It is 0.3 miles down the road on the left. Decent food and they have beer also. The two entrances to the restaurant the first one you can catch the second one. Caution it is a gravel parking lot. on January 4, 2009 0 out of 1 members found this review useful. This was a nice ride. Just did it today 1/3/09 in combination with the 688 route. One thing about 601 though- it seemed to have a little line of gravel in the center of the otherwise nice road for most of the way. This made me slow way down on curves... but then again I've only been riding a month so maybe it was nothing to be wary of... but rather to err on the safe side eh?